One of the biggest problems facing any tutor of sculpture, whether in clay, stone or wood, is that of the student's desire to apply detail to the piece before the actual form has been achieved. By this, I mean that carving eyes, nose and mouth will not make a realistic face if the piece isn't actually face shaped. Nor will the addition of fingers to a hand make it right if the hand shape isn't accurate to begin with. This principle applies to whatever we are trying to carve. The differences between many of the individual members of various groups of animals are often very slight. Essentially, horses, cows, deer, etc. are basically the same structure yet look very different. Members of the dog or cat families are similarly very much alike in anatomy, but look very different in real life. We don't need to re-learn each one every time we do a new carving. We should study, first of all, basic human anatomy so that we have a clear understanding of the human structure. 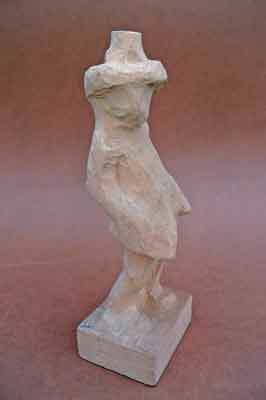 We can look to find the similarities and differences for each new animal or figure we want to carve. You will be very surprised how little these are. What is most important when carving animals is that you determine where the various joints are. You will find that the movement in these joints is the same as those in the human body as a rule. Once you have decided on your subject, find a decent photograph and list all the important dimensions in 'head lengths'. Then look at as many pictures and films or videos of the subject so you can to get the essence of the animal - how it moves, sits, stands, runs, walks, etc. Is it a fast or slow mover? How does it eat? Is it a predator or prey animal? These have very different characteristics. Next, you need to imagine its shape as a silhouette, with no obvious detail at all. You may prefer to imagine it wrapped in cling-film or similar to an Egyptian mummy, wrapped in bandages. Whichever works for you is fine, but what you are actually doing is seeing the subject simply as a shape with no detail or features. It is this shape that you need to get right, before you even think about adding any detail to it. Look at silhouettes - they are only black shapes, but you can get a lot of information from these shapes. I am sure many of you will have seen the rough outs that are very common in the United States and are becoming more readily available in Europe. 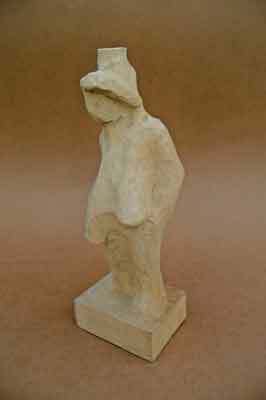 These can range from being very rough indeed with a considerable amount of work needed to get any sort of decent carving as a result, to being extremely finely done and therefore needing virtually just cleaning up. Whether you like these or not is a matter of personal preference - they certainly save a lot of time and don't require anything like the amount of knowledge of the subject to complete the carving. Here, though, is where I have problems with these: the carver doesn't go through the 'body language' stage and as a result has little understanding of the actual structure of the subject. Rough outs are fine for the professional who wants a quick result time after time, but I am not sure about the rest of us. Each to his own. The photos here show a rough out that I received from Dave Stetson, a friend of mine in the USA. I think you will agree that the body language is very evident without any detail at all. The tilt and turn of the body are already there, as well as the angle and direction of view of the head. This is the sort of thing I feel we should be aiming at before we attempt any sort of detailed refining. I am not saying that we should carve from rough outs, but that the simplicity of form shown is something we should aim for before trying to include more detail. Exactly the same principle applies to relief carving - many carvers draw all the detail of their proposed carving onto the wood and then carefully and tentatively cut away as much as they can without losing the lines they have drawn. 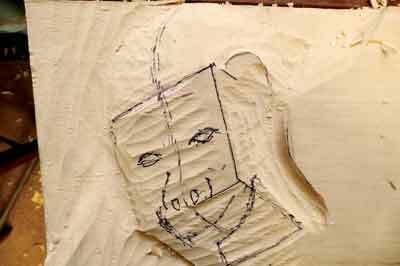 This will inevitably result in a carving with very little depth produced very slowly and probably under a great deal of stress and will involve much re-carving. Rather than drawing the pattern on the wood, I recommend that it is drawn on a piece of clear acetate sheet and only enough of the outline drawn on the wood so that the background can be removed. Once this background is gone any prominent parts of the picture can be drawn by laying the acetate over the block and then drawing any features underneath. In effect, this means that when you carve this, you are carving from the back coming forward. The background depth has established how deep the carving is going to be and you know exactly how much wood you have to play with. All your angles and perspective should be included at this stage, but the finer detail should only be added when you are satisfied that everything is as you want it. 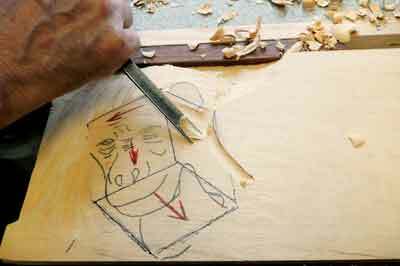 With relief carving there will inevitably be minor adjustments necessary throughout the carving process and detail added too soon will only have to be removed and carved again during this process. 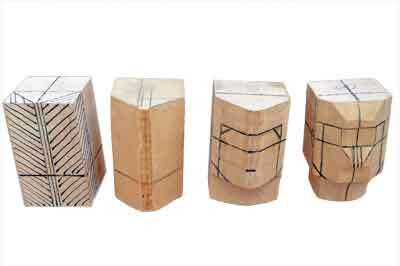 It is useful with any relief carving to try and divide your picture into a series of box shapes that will give you an idea of the various angles and planes involved. 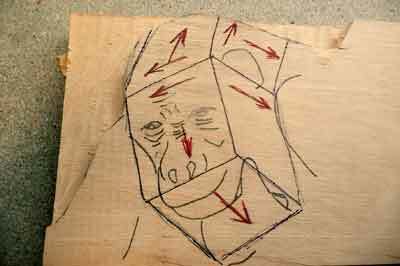 In the photos of the gorilla head on page 58, you can see the outline taken from the preliminary sketch of the head transferred to the wood and the basic box shapes within which the head fits drawn onto it. Once the background has been removed, you need to cut the angles created by the box or boxes; this will make the final shaping so much easier. The fourth photo shows the angles formed prior to adding any detailed shaping and the first photo shows the finished piece. If you have an irrepressible need to have detail earlier, add it with your pencil - you can always rub this out if you wish to change. Back to carving animals - one of the most useful pictures you can get is the basic skeleton. This will give you all the proportions you need and you can add the 'flesh' yourself. Forget the eyes, mouth, and nose, etc. on any mammal carving as once the head shape is correct, these will fit in very easily. This is especially relevant with human carvings. 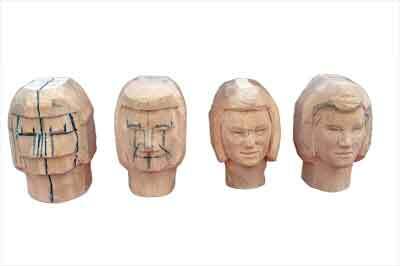 Many carvers have this need to add all these details to faces while they are still square and flat. Unless the angles and curves are right on a human face, you have absolutely no chance of getting any of the facial detail correct and you will never get away from carving flat faces. In fact, if these are accurate you may even not need to add all the detail you feel you need. The average face will go back at a maximum of 45° each side of the nose making a total angle of 90°. One of the final two face stages shown above is with a total angle of 90° and the other is 75° - neither looks unnatural in my view. In case you are worried, the one on the far right is carved at 75°. The most important thing is to get a definite angle to the face before adding any features. You might find the exercise of following the stages shown quite therapeutic and helpful if you have problems with heads and faces. Why should eyes be the problem that they are to the carver? Most of us carve faces that are not more than a couple of inches or so in height, so how much eye detail do we need to see? If you look at someone more than a few feet away you will only see a shadowy line and it is more often the position of the head and body that will give an indication of the direction in which the subject is looking. Too much fine detail in small carvings can destroy the piece unless the tools, material and skill of the carver are up to miniature carvings and the fineness they require. We don't all want to carve in boxwood (Cornus florida), fruitwoods or ivory all the time. 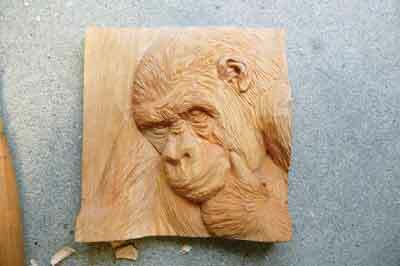 I think one of the problems most of us have is that we want to carve a different subject each carving we do. Unfortunately, for any carving to be successful a great deal of work and research is necessary to get everything correct. As I mentioned earlier, you really need to spend weeks studying the anatomy, the way the subject stands and moves, what sort of life it leads, in order to understand what you are trying to carve. All these things affect its build, the shape of its body and legs, the way its eyes are placed and so on. If you are going to put in all this effort, it makes sense to do more than one carving of that subject before moving to something else and starting all over again. So, I leave you with one small thought. You cannot possibly carve something that you don't know and expect it to be successful. You may copy someone else's piece but, if you haven't gathered all the necessary information about it you will only produce a very poor substitute and are relying on the knowledge and accuracy of the original artist. My belief is that it doesn't take a great deal of skill to push a chisel or gouge through a piece of wood - it is knowing what wood to cut away and what to leave that creates the problems. Also, if you can write your name, then you can draw. The limiting factor in both of these is how much you actually know about your subject. It is the ability to see what we are looking at that we have to learn and that is not easy. 1. Tell them what a robin looks like in detail without using the word red so that it can't be any other bird. 2. Without using the words water or fish, explain the difference between an otter and a stoat, ferret or marten. 3. Explain the difference between the eyes of a carnivore and a herbivore - prey and predator - and explain why they are different. All of these require you to look at things in a very different way as much more information is needed than we normally gather when we look at something. It is this information that we need to produce a successful carving. Once you start to see things in this way it will change your life.